With over 80 years of experience, Diamond Chemical is one of the largest privately owned national cleaning and sanitizing product companies in the United States. We are a manufacturer of laundry, warewash, floor care, housekeeping, sanitizing, organic intermediates, vehicle care, and other industrial and institutional products. 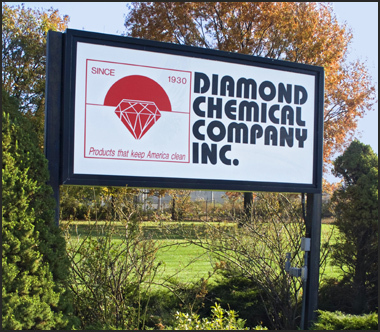 Diamond Chemical Co., Inc. maintains its corporate headquarters in East Rutherford, N.J. Diamond's facility is situated on 12 acres and contains an approximately 150,000 square foot complex. This complex houses our corporate offices, laboratories, manufacturing and warehouse operations. Part of our facility includes a 10,000 square foot, state-of-the-art laboratory which enables us to ensure consistent, high quality products for our customers. Our labs include: Quality Control, Research and Development, Quality Assurance, and Technical Services and are staffed by a full complement of highly qualified chemists. Our chemists not only provide you with the most up-to-date and innovative products, but will help you with unique product requirements, expert analysis or environmental concerns. Diamond Chemical and our divisions/affiliates through our vertically integrated production facility offer superior quality products, programs and services. When you combine that with comprehensive laboratories, excellent customer service, our own art department and truck fleet you will know why Diamond Chemical Company is an industry leader.